Ben Millar, his girlfriend Taryn Keith and the tip that changed their lives. 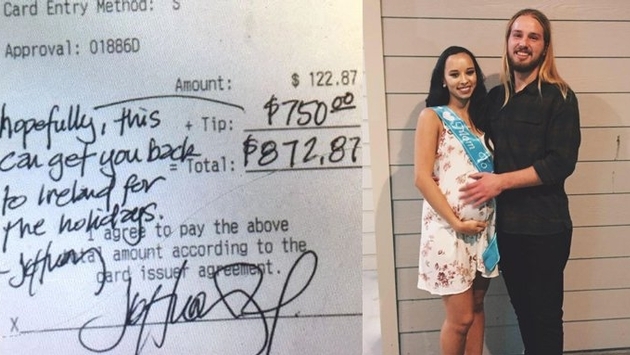 An Irish waiter working at an American restaurant in Texas received a massive tip from a customer who said the money was for the man to travel home to see his family this holiday season. According to The Independent, the waiter—22-year-old Ben Millar—was talking to a customer identified only as Jeffrey about the band U2 when he mentioned how he would love to return to Ireland to see his family during the holidays. Millar and his 21-year-old girlfriend Taryn Keith are eight months pregnant, and said they have been planning to visit Ireland once their son, Killian, is born and old enough to make the flight. Keith said that Millar has been stressing about their current fiscal situation. Before Millar was able to properly thank the customer, he was already gone. By sharing the story, though, Millar and Keith are hoping the man sees how much his generosity meant to their family.